It’s hard not to look at HTC’s new flagship smartphone, the Touch Diamond, through iPhone-tinted glasses. Featuring a touch screen interface that’s been designed, on the surface at least, to be operated using a finger rather than a stylus, like Cupertino’s own crown jewel, the Touch Diamond is marketed as a device that makes accessing the Web on the go just as easy as making a phone call. 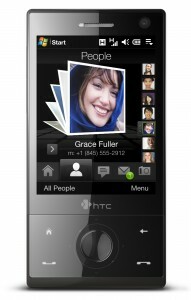 It’s also HTC’s latest attempt to put a consumer face on the business oriented Windows Mobile operating system. No mean feat in itself. 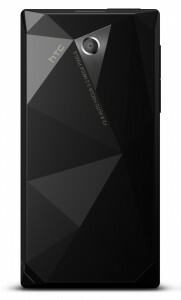 Read on to find out if the HTC Touch Diamond truly sparkles or if it’s just an expensive piece of “bling” (Ed. enough puns already). The first thing you notice about the Touch Diamond is that despite being a touch screen device, the phone is both candy bar in shape and size. In this respect the hardware design leans more towards something from Sony Ericsson rather than Apple’s iPhone. Having said that, the Touch Diamond remains minimalistic in design. The 2.8-inch touch screen takes up most of the surface aside from four dedicated buttons (home, back, answer call, end call), along with an iPod-like virtual scroll wheel that also acts as a directional pad. On top of the device is an on/off button and down the left hand side are volume controls. Tucked away in the bottom right-hand corner is a stylus, held in by a magnet. This might seem like a design flaw on paper but in practice it actually works really well. As you begin to slide the stylus back in it reaches a magnetic tipping point and automatically snaps into place. At the bottom of the Touch Diamond is the dreaded all-in-one Mini USB port, which, as with other HTC phones, is used for charging, syncing, USB drive mode and for connecting the supplied headset. The obvious downside to this approach is that you’ll need to purchase a third-party adapter if you want to use your own headphones. The Touch diamond offers two cameras: one front mounted for video calls over 3G, and an auto-focus 3.2 megapixel camera for taking pictures and shooting VGA quality video. The phone also features an accelerometer which is employed in a number of applications, mostly notably to change the screen orientation when browsing the Web. Another nice use is that you can switch to ‘silent’ mode by turning the phone face down. Overall, the Touch Diamond feels comfortable in the hand and looks pretty slick, even if it is a bit of a finger print magnet. The only contentious part of the hardware design is the diamond embossed back cover which isn’t to everyone’s taste. In fact, HTC are reportedly supplying a re-branded version of the Diamond to a number of carriers without the jagged rear casing. The Touch Diamond features all manner of connectivity including Wi-Fi, HSDPA, along with assisted GPS. We found call quality and reception to be excellent, although the speaker phone was a bit on the quiet side. On the storage front, you’re limited to the built-in 4GB of solid state memory, which, similar to the iPhone, can’t be upgraded via a memory card. In terms of juice, the Touch Diamond has a 900mAh battery, which is on the small side. In our testing the phone ran for a full day with moderate use of Wi-Fi and 3G data etc., but not much longer. The idea behind HTC’s newly designed User Interface, TouchFLO 3D, is to transform Windows Mobile into something that is both eye catching and – crucially – something that can be operated with a finger. In other words, you shouldn’t need to take out the stylus to access the phone’s main applications. That’s the idea anyway. At the bottom of the screen are ten icons: Home, People, Messages, Mail, Internet, Photos and Videos, Music, Weather, Settings, and Applications, which you can scroll through by swiping your finger horizontally back and forth. Upon selecting an icon, it’s corresponding application screen is then launched, all keeping within the Touch Diamond’s finger-friendly UI. Contacts in your address book, for example, can be browsed with a flick of the finger, cover flow-style, or by tapping the virtual up and down buttons. Likewise, when in the Photos and Video screen, thumbnails are presented one at a time ready to be flicked through, as is album art in the Music screen and so forth. While HTC have achived the first goal – TouchFLO 3D looks fantastic – the UI falls short in two crucial areas: It doesn’t scale very well, and can at times feel rather unresponsive. For example, try loading the phone up with over a hundred contacts, and then flick all the way to “Z”. To tackle this problem, TouchFLO 3D offers to drop you into list view and, disappointingly, right back into the standard Windows Mobile interface, which is of course designed to be used with a stylus! Even if we ignore the fact that HTC’s finger friendly UI is only skin deep, its less than snappy performance is a lot harder to forgive. We’re not sure it’s the hardware that can’t keep up with TouchFLO’s 3D effect or if it’s the Diamond’s “resistive” touch screen, designed for both finger and stylus input, that makes it lag a little. Our guess is it’s probably a bit of both. Aside from the usual Windows Mobile applications such as Office Mobile, Windows Media Player and Windows Live Messenger, HTC have bundled a number on non-Microsoft applications that deserve a separate mention. First up is HTC’s own Weather app, which appears as one of the ten icons featured when in TouchFLO 3D mode. This app is similar to widgets like the ones you find on the iPhone or Google Gadgets on a PC. In this case, weather conditions are beautifully animated and can be preset to display local conditions city by city. 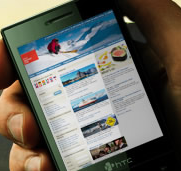 While Microsoft’s Pocket Internet Explorer is included as an option, HTC have made the smart decision to offer the latest version of Opera Mobile as the default Web browser. Features such as support for modern Web standards, tap to zoom, and re-formatting of text to eliminate horizontal scrolling, all create a very pleasant surfing experience, limited only by the Diamond’s smallish screen. Similar to the iPhone, HTC have also created their own dedicated YouTube client, which although not quite as polished as Apple’s, works well enough. Another Google property is also supported out of the box with the bundled Windows Mobile version of Google Maps. Although there’s lots to like about the Touch Diamond, not least its stylish and thoughtful hardware design, and TouchFLO 3D’s good looks, it never quite escapes the fact that Windows Mobile is designed to be used with a stylus. As much as HTC have attempted to customize Microsoft’s OS to make it finger friendly and more appealing to the consumer market, the resulting compromises suggest that HTC might be better off taking Apple’s all-in-one approach in which the company controls the complete user experience by designing both the hardware and software. Alternatively, perhaps HTC needs to find a new OS partner (or hope that Windows Mobile 7 finally delivers), as there’s no doubt that they know how to do hardware. Nice review. Still disappointed that they didn’t manage to squeeze in a microSD slot in there. Having used HTC devices for some time now, I couldn’t wait to try the new Touch Diamond and now after using one for a week, I am very happy with it. It will take a bit of getting used to and all the comments about it needing the stylus are valid (although, with patience, the finger can be used most of the time). The extra features such as having a favourites in the contacts folder help you from having to scroll through your 1000 long list of people and a decent web browser are very welcome. My last HTC device had a sliding keyboard and was therefore very thick, so much so that once protected in it’s case did resemble a brick once put in my pocket. To think that HTC have bundled all these features into the size of the Touch Diamond is incredible (although I have had mixed results with the BlueTooth). I think I would sacrifice a little of this “compactness” for a slightly larger screen and definitely a MicroSD slot……and, as it would be a slightly larger case…. a bigger battery would come too.! As a business user I found I had to make a decision between the Touch Diamond and the Touch PRO…….toss up between size and SD slot….. Size won ! Although, I don’t want to have to choose. Why can’t I have it all ? This Htc diamond is totally disappointment.After purchasing the phone only one month.I have send in the phone for repair 3 times and worst the customer service don’t even bother about customer complain.They don’t allow the customer for one to one exchange and still insist they are right.So if anyone want to buy the phone think carefully and prepare to go to the service centre. Totally agree with Mr Ho. Not only is HTC Touch Diamond an expensive piece of junk. Their service is appalling. I have personally thrown the Touch Diamond into the dustbin and have reactivated my Sony Ericsson K810i. Well I’ve had my htc diamond for a few weeks now and I have to say I am mightly impressed! I have push email on my works exchange account and my hotmail account; my rss feeds including alerts on keywords is super and the web surfing; utube experience really is outstanding. I dont see the stylus/finger switch over any problem; I prefer the stylus if anything. Make no bones about it; this is a powerful; complex piece of kit that gives you enough to go to meetings away without the need for a laptop…. Very good review, thanks. But disappointed comments above will make me think twice before buying HTC. is absolutely everyone sold on the I-pod? why does every new phone have to be compared to the I-phone? I woundn’t use it if someone gave me onbe for free. 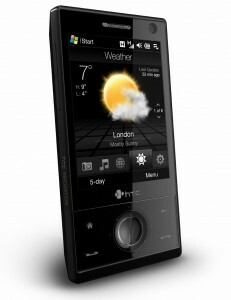 This new HTC touch diamond is far superior from a technical standpoint and what application processes are possible. Myself I use my HTC for work, I have a library of nursing bo=oks and porgrams all not available on the I-phone. I think the new htc Diamond has the graphic capabilities to compete with the I-phone but blows it out of the water from a application stand point. There are so many more programs and features available for Windows mobile plus many are free! All my nursing programs I get for free and update daily with all the newest meds, alerts, FDA warnings, etc. none of which is available for the I-phone. To each his own but for what i use this phone for it is the Bomb! Anyone buying a new updated HTC Touch Diamond cell phone and would like to sell me their used one, please let me know at allise@ntl.sympatico.ca. Nice Mobile HTC Touch Diamond Model my professorers using the Unlocked Mobile HTC Mobile.